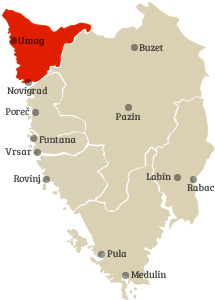 NW Istria consists of the region comprised of Umag, Novigrad, Brtonigla, and Buje. Not only does NW Istria have a lot to offer for both adults and kids, but it also has a diverse array of choices. The region has some of the best hotels and camps in Istria, many beautiful swimming beaches, lots of exciting sporting activities and events, and extraordinary culinary and wine traditions to enjoy. As Croatia's westernmost city, Umag throws open the gates, embracing travelers from all points across Northern Europe to Croatia's breathtaking Adriatic coast. Once the summer residence of influential Roman citizens, the city of Umag gracefully exhibits architectural remnants of its historic past. Town walls and defense towers from the 10th century and lovely details of an ancient, grand, coastal Roman villa, nestled up to lush hillside vineyards and olive orchards, handsomely display its resilience. Umag has endured rule by the Romans, Byzantines, Lombards, Francs, Venetians, Turks and Genovese, only recently gaining independence. That newfound freedom has launched a wonderful era of tourism, inviting the world to explore Umag's blue flag ACI marina, 45 km of coastline, its ATP international tennis tournament, the Adriatic coast's oldest lighthouse, and exhilarating hiking, biking, climbing, and camping pursuits. Umag is truly the gateway to the Istrian peninsula, as well as a splendid Croatian holiday. Derived from the Latin "humagum," the name Umag is likely a derivation of "humus" meaning "fertile," and "magum," meaning "cultivated field." - ATP Tennis Tournament: Held in late July, this popular event draws top tennis players and their fans; nightly concerts and parties. - Beaches: Umag is known for its many blue flag beaches along the 45 km coastline. - Umag Town Walls: With gated draw-bridge, dating from 10th century. - Umag Town Museum: located in a preserved medieval defense tower. - Assumption of Virgin Mary and St. Peregrine Church: Dedicated to the patron saint of Umag. The 33m bell-tower originates from 1651. - Lighthouse of Savudrija: The oldest lighthouse on the Croatian coastline, legend has it that Count Metternich built the structure to express his love for a Croatian woman who tragically died on the same night the lighthouse beamed the first light of love. - Wine and oil tasting in Savudrija: Taste the oil from Farm Jola and wine from Degrassi vineyards. - Umag Train: Runs every 15 minutes between old town of Umag and Katoro with stops along the way. - Umag Segway City Tours: Fun on two wheels throughout Umag. - Subaquatic Diving Center: Diving from novice to experts. - Glassboat Aquavision: See the fish, underwater reefs, and remains of the sunken town of Sipar through glass-bottomed boats. - Golf Club Adriatic at Kempinski Hotel: First 18-hole championship golf course in Istria. - Wellness treatments in hotels: Many hotels offer soothing spa treatments. See Chapter 32 for more information. - Accommodation: Hotel Melia Coral, Kempinksi Hotel Adriatic, Hotel Sol Umag, Melia Istrian Villas, and Sol Aurora. The sheltered harbor of Novigrad, on the west coast of the Istrian Peninsula, was likely established as a military outpost in the late Antiquity transition period during the rise of the Roman Emperor Diocletian. The harbor, or Mandrac, continued to attract settlers, especially fishermen, throughout the ages. In Novigrad, visitors will discover Roman remnants from the fourth to the seventh centuries, Slavic cemeteries from the seventh century, a ciborium altar canopy used by Bishop Mauritius during the reign of Charlemagne, a classic Baroque church in St. Pelagius, and impressive stone walls, town loggia, and fortifications from the Venetian era around the mid-1200s. Visitors will also enjoy a lively, contemporary city with culinary emphasis and artistic expression known throughout Europe. All will find a stroll through the shops and homes on the charming, narrow streets an unforgettable experience leading to the heart of the city where engaging waterfront events take place. Often referred to as Cittanova d'Istria in Italian, Novigrad Istarski in Croatian, and originally Emonia via Greco-Roman influence, a visit to this inspired fishing village holds wonderful cultural, culinary, and historic treasure. - Novigrad Old Town: Enjoy a glass of wine and beautiful sunset in the Old Town city streets. - Novigrad town walls: Towers and what were once the main town gates. - Museum Lapidarium: Museum of Croatian history. - St. Pelagio and St. Maxim's Parish Church: Dates back to 1883. - Gallery Rigo: Contemporary Croatian art. - Gallerion K.u.K. Marine Museum: Celebrates Novigrad's maritime history with an entertaining display. - Istralandia Aquapark: Waterpark with over 20 waters slides, located between Novigrad and Brtonigla. - Taste the Novigrad Kapesante: Novigrad pilgrim scallops, locally called kapesante, are considered one of the tastiest shellfish in the world. - Gnam-Gnam Festival: Consists of eight gourmet events throughout the year. - Pinesta Beach: Beautiful sandy beach. - Istria Granfondo Family & Gourmet Tour: Held in October. A 25 km long recreational bicycle tour around Novigrad and its surroundings. - Accommodation: Hotel Laguna, Aminess Maestral Hotel, Hotel Villa Cittar, Hotel Nautica, and Hotel Emonia. Brtonigla is first mentioned in written documents in 1234 as Ortoneglo or Black Garden, a name it received from the dark soil that is typical of the area. Brtonigla also has many sites dating back to the Neolithic era and Bronze Age, which hark back from 2100 to 1000 BC. The Roman Empire occupied Istria in the first century and Roman remains are scattered over the entire region of Brtonigla. Recognized for its wineries and olive oil growers, visitors to Brtonigla can also enjoy exploring historical sites, and participating in famous folk festivals. - Mramornica Cave: One of the largest caves in Istria, with parts as deep as 60 meters below ground. - Istralandia Aquapark: Waterpark with over 20 water slides. - Paragliding: Go paragliding with GoFly. - Winemakers and Olive Oil Producers: Visit local winemakers and olive growers. See Chapters 17 and 18 for more information. - Skarline Nature Park: Park is named after Skarline stream that springs in the park and which has created a green canyon along its route to Mirna River. - Unique Soil: The only place in the world with four types of soil – red soil (terra rossa), black soil (chernozem), grey soil and white soil which are used to grow different varieties of the famous Istrian Malvasia wine. - Local Taverns: Plethora of Istrian delicacies. - Mushroom Days: Mushroom exhibition held at end of October with presentations and expert guidance on all types of Istrian mushrooms. - San Rocco Hotel and Restaurant: Fernetich family has been an evangelist of tourism in Brtonigla for over two decades. Like many other Istrian towns, Buje has a long history dating back to the Bronze Age. Valued for its panoramic views, surrounding vineyards, and lush olive groves dotting its hillside, the town was a Roman settlement, then a medieval Venetian city, remaining under Italian rule from 1918 to 1945. An important border crossing from Italy and Slovenia, Buje has held a position of importance in government and economy for centuries. Our Lady of Mercy Baroque era church, and the Ethnographic Museum are highlights, but Buje is the start point for many wine road tours, visiting 23 winemakers along the route. Similarly, olive oil road tours encourage sampling produce from many producers in the Buje area. - Panoramic Views: Wonderful views of Slovenia, Italy, Austria, and Croatia from the top of the “watchtower of Istria’’ that dates back to 15th century. - Town Walls: Buje is surrounded by ancient defensive walls and maintains a medieval atmosphere. - Olive Oil: Buje is known by local producers and factories that offer extra virgin olive oil. - St. Servelus Church: This Baroque church located at the main square dates back to the 18th Century, housing a music organ constructed in 1791. - Civic Museum: Includes arts and crafts by local artisans. - Off-Road in Istria: Rent a car or go on a 4x4 tour with Camelus Tours. - Momjan Castle: Located on a rock just beside the town of Momjan. - San Servolo Brewery: Local brewery with a visitor’s room, full bar, and terrace. - Wine: Taste the Momjan Muscat. Visit local wineries, including Kozlovic Winery, Kabola Winery, and Prelac Winery. - The Festival of Grapes: This event in September marks the start of the grape-harvesting season with family entertainment. - Istria Wine & Walk: The 11 km tasting walk in May consists of delightful meetings and tasting sessions with 8 Istrian winemakers and 8 local producers and caterers. - Accommodation: Casino Hotel Mulino, Al Merlo Olivo, and La Parenzana. Additional information about NW Istria is available from the Istria Tourist Board at Colours of Istria where you can also download a free mobile app of NW Istria.